Editor's Note: This story was updated Feb. 5. Changes include quotes from Bishop Michael Olson, Bishop Steven Lopes, and Father Christopher Stainbrook, pastor of St. Timothy's in Fort Worth. HOUSTON -- Envoys of the Holy See along with dozens of American Roman Catholic prelates gathered on Tuesday with congregants at the Co-Cathedral of the Sacred Heart for the history-making Mass of Ordination and Installation of Bishop Steven J. Lopes, the first bishop of the Personal Ordinariate of the Chair of St. Peter. 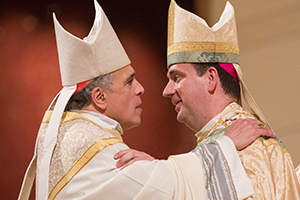 Appointed by Pope Francis in November, Bishop Lopes took the reins from Msgr. Jeffrey Steenson, who announced his retirement last year. “We thank God for Pope Emeritus Benedict XVI and his Spirit-prompted vision of unity and faith in a diversity of expression which informs the apostolic constitution Anglicanorum coetibus,” Bishop Lopes said. “We thank God for our Holy Father Pope Francis for putting his vision into concrete expression,” he continued. Among bishops on hand to commemorate the event were Bishop Michael Olson of the Diocese of Fort Worth and Bishop Kevin Vann, Olson’s predecessor and Ecclesiastical Delegate for the Pastoral Provision, a position he has held since 2011. Bishop Vann, now bishop of the Diocese of Orange in California, will work closely with Lopes in fostering priestly vocations. 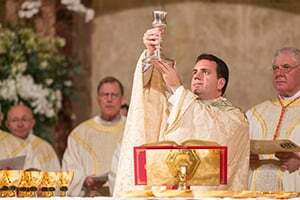 Lopes, 40, who was ordained a priest by Cardinal William Levada then the ordinary of the Archdiocese of San Francisco in 2001, assumed his new duties on Candlemas Day after serving as an official for the Vatican Congregation of the Doctrine of the Faith since 2005. That office is responsible for promoting and preserving Catholic teaching. Lopes, who holds licentiate and doctoral degrees in sacred theology from the Pontifical Gregorian University in Rome, was named a monsignor in 2010. 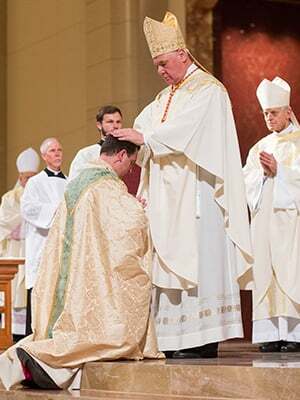 “We hold you suitable, beloved son, to carry out this office as you stand out by firm faith, good character, piety, wisdom, zeal for souls, charity, and other virtues,” said Pope Francis’ apostolic mandate announcing Lopes’ appointment, which was read aloud to the assembly during Tuesday’s ordination liturgy. Cardinal Levada delivered the homily. “Today is Candlemas day, the feast of the presentation of the Lord,” Cardinal Levada said. “Today, is the blessed day when Jesus was presented in the temple by Mary and Joseph. Outwardly He was fulfilling the law, but in reality He was coming to meet his believing people. Among the believing people He met in the Jerusalem temple, the names of Simeon and Anna have sounded down the ages. 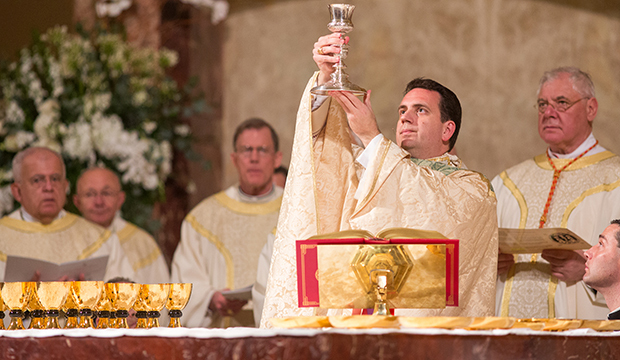 But the liturgy is not simply about a past event. 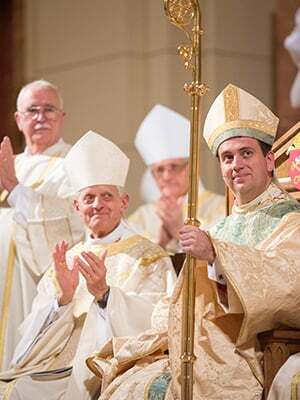 Bishop Lopes’ appointment marked the continuation and a fuller maturity of Pope Benedict XVI’s 2009 Anglicanorum coetibus, the apostolic constitution that created a pathway for Anglican parishes to join the Catholic Church through ordinariates, structures akin to dioceses. It represented the most significant move toward reunification in 450 years. Pope Francis’ mandate to appoint Lopes, “affirms and amplifies Pope Benedict’s vision for Christian unity, in which diverse expressions of one faith are joined together in the Church,” a Nov. 24 ordinariate press release stated. The connectedness and direct link to the apostles is something that can only be achieved through a bishop, Father Christopher Stainbrook, pastor of St. Timothy Catholic Church in Fort Worth told the North Texas Catholic in an interview. Pope Benedict’s action expanded John Paul II’s 1980 Pastoral Provision, which provided the framework for Episcopal priests to become Catholic. Churches in the Ordinariate are in full communion with the Roman Catholic Church, yet have been allowed to keep some of their Anglican liturgical traditions. Any Catholic may attend Ordinariate liturgies and functions, just as members of the Ordinariate can attend liturgies and functions at any traditional Catholic parish. The Chair of St. Peter, based in Houston’s Our Lady of Walsingham Church, is one of three ordinariates worldwide. Its jurisdiction is the United States and Canada. According to data provided by officials, the ordinariate includes 62 priests and more than 20,000 parishioners in 43 parishes, including St. John Vianney in Cleburne, St. Mary the Virgin in Arlington, and St. Timothy. Bishop Olson, in comments made to the North Texas Catholic, explained the close ties the Diocese of Fort Worth shares with the ordinariate. Other Personal Ordinariates are Our Lady of Walsingham in the United Kingdom and Our Lady of the Southern Cross in Australia. Monsignors Keith Newton and Harry Entwistle, ordinaries of Walsingham and Southern Cross, were also in attendance at the ordination Mass. Lopes also shared his inspiration for the maxim “Magna Opera Domini,” recalling a retreat of Ordinariate priests and seminarians in Florida. Lopes had already personally read all the dossiers of each of the priests. Many there shared their stories of journey to Catholic reunification and their search for the truth in sacred Scripture, along the way sacrificing and confronting suffering. They had left behind what was familiar and comfortable for what at times has been a lonely path. Msgr. Steenson was installed as ordinary in 2012. Though a member of the United States Conference of Catholic Bishops, he was not eligible to be a bishop in name because he was married. “He was the pioneer who led us where we needed to be led,” said Fr. Stainbrook, who used the image of Moses to compare the work of Steenson. Only a bishop, of course, could offer the connectivity to the apostles, something Steenson recognized. Steenson had asked the Vatican to consider appointing a bishop a year earlier. At the time of Lopes’ appointment in November, Steenson said: “I welcome this news with all my heart, for the Ordinariate has now progressed to the point where a bishop is much needed for our life and mission. A bishop will help to give the Ordinariate the stability and permanence necessary to fulfill its mission to be a work of Catholic unity. Lopes’ installation coincides with the Ordinariate’s new missal Divine Worship, the definitive book of liturgical texts for Mass in the Personal Ordinariates.